Today didn’t go as planned! It was productive and the little issues that came up have been solved, but looking at a computer all day with little sleep has given me a headache. No workout today. Even my plan for a short walk around the block was defeated by a scanner that didn’t want to scan. I am hoping for a good night’s sleep and a refreshing three day weekend…for all. I didn’t do yoga this morning. I slept in after being up for another three hour break in sleep. I couldn’t see getting out of bed (as I was awake) when my alarm went off and knowing I’d been up since 2. I plan to do something later. I also decided to share my daily workout here, especially as it gets more difficult closer to my due date. Accountability through honesty! I tell myself constantly that I need to do more yoga, but today I’m serious. I woke up about 1:15am in a bit of (completely normal) pain. So I slept in and did the 20 minute Yoga Download workout I have and felt a lot better. I also spent about half the day sitting on an exercise ball. I must prioritize yoga. It is one of the toughest things for me to work into my home workouts, even though I used to take 5-6 classes a week. My plan is to go to two strength training days a week and make the third a tough yoga day. And hopefully I can find days to work in the 20 minute workout, and actually get my Sunday yoga in. Waking up and working out on days I don’t have to work is getting harder for me. I wake up very hungry, eat and then sometimes like to chill. And chill some more! Good for rest, but not for yoga. And if my husband is around, doing yoga in the living room isn’t as calming as one would hope. He wont be up tomorrow morning when I want to do yoga and I have to work, meaning I have an exact time I need to start. So all should be good as long as I sleep tonight. So I should get off the computer and get to bed. I get up at 5am most weekdays, so I like to get ready early. Shut eye is important! Two (two!) weeks ago, I posted that I had recipes to make and all the ingredients to make them. In two weeks, I managed to make two of three recipes, and it is highly probable that if the chicken wouldn’t have gone bad, that would have gone unmade also. Today I bought more chicken to make the Sesame Chicken again. The clam dish has not sounded appealing, but I should make that before Monday. I am now 30 weeks along and I’d like to make and freeze dishes to have on hand once the baby gets here, but I also have to feed us now! Luckily, my husband does not depend on me to cook for him also, so most of my meals are just for me. I try to find things he will eat also, but he is picky about everything, doubly so about leftovers. Sometimes I can make a meal for dinner for both of us, but then I will eat the leftovers for lunches. But I’d rather not cook every evening. I don’t know how people do it. I need to find more recipes that he will try. I can at least prep things once a week so I don’t have to chop vegetables daily. I want to make more of an effort in this area, but there’s only so much you can make sticking to mostly chicken (no beans, fish or ground meat other than beef for the husband, no beef or pork for me). Time to break out the crockpot! 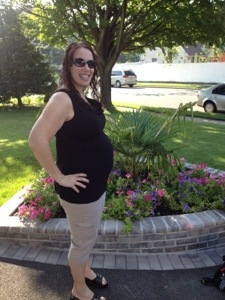 Here is me, today – 30 weeks. I usually work from home, so this is as dressed up as I get a lot of days. I have now done the first, second and third trimester workouts on the Pregnancy Fitness video (I purchased at Target). Each has cardio and weight segments and it is a nice balance. I definitely would consider this on the beginner side, although if you are a true beginner and did not exercise before pregnancy it isn’t for you. The cardio portions have you moving, but don’t really get the heart rate going (which I’m sure is on purpose!). The weight segments are good and you can use heavier or lighter weights to customize each workout to your level. Each video has three people showing different ways to adjust. One is a lower intensity – you could follow her on an “off” day, or if you are having a complication that isn’t a contraindication to exercise. In the third trimester video, the lower intensity modifier has diastasis recti and gives even more modifications than in the first and second trimester workouts. All three use weights for the level they are showing, and it is announced at the beginning what they are using. I love this. I like knowing what specific weights are used, especially my first time through! The workouts are given by Lindsay Brin, not pregnant in these videos. She is peppy and seems knowledgable, but says buncakes. You’ve been warned. There is also a postnatal boot camp disc that I haven’t tried. There is a lot of talk of yoga being on the discs. I only see yoga on the postnatal disc, so I did not try it. My favorite experience with Lindsay Brin was separate from this DVD set. I found her second trimester Youtube video which was a terrific workout. I found that the cardio sections were getting my heart rate a bit too high, so I usually did 20 minutes of cardio on my own before doing the weight exercises from the video. Though I found this more challenging than the DVD, using lighter weights would make it less so. I wish there were more workouts of hers like this online! I’ve been happy with all of these workouts and I’m glad I found them early on. What happens when there is a party at a pregnant lady’s house (or at least this one)? Too many desserts! I made way too many cupcakes, plus brownies, and someone brought a bunch of cookies. More than half were leftover. I had made funfetti cupcakes and chocolate cupcakes. And they were delicious for two days. Still delicious today, but really something had to be done about them. Besides me eating them. So I decided to crush them. 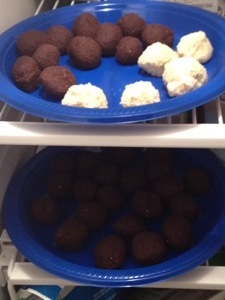 Cakeballs usually start out with prepared cake and frosting. Cupcakes are just that! I crushed them, shaped them into balls and put them in the freezer. At least the chocolate ones. The funfetti ones didn’t work as well. I think they were too moist. But my husband says he will be happy to eat the crushed cupcakes. Once they’re frozen on plates, I’ll transfer them to baggies and save them. When I want to make cakeballs, I can just dip them in chocolate and they will be ready. Much better than wasted cupcakes…or the other alternative of eating them all now. When life gives you too many cupcakes, make cakeballs! We all do it, and I’m sure at more stores than just Target. But that’s where I notice it the most. Of course I’m talking about going in with a list and coming out with 20 more items than were on it! I went today for a few things. While I was there, I remembered wanting to checkout the bath accessories and found things I liked. I also realized I probably needed wrapping paper for the gift I bought. I don’t think I did that terrible today. I did forget to use some coupons that were in my wallet though. Other things going on this exciting Friday night are food shopping (done) and fixing up some pillow cases I made in April. I’m not great at sewing things that last, but I’m decent at making things that will do for a while. We have our block party tomorrow, so I plan to go to bed early and get up early to start on my day. First thing tomorrow should be a workout. Then making cupcakes! Exercise then baked goods…always better than the other way around! That’s a lot of weeks! I had an appointment today and all is well. We have a thumb sucking little girl who measures right on track. An odd thing I spoke to my doctor about today is clogged ears. I often feel like there’s water in my ears which is fine health-wise, but annoying. Especially when it is happening most days. He thinks that it is being caused by my allergies, and there isn’t much that can be done about it. I’m glad he didn’t think it was a result of anything more serious. I did not get a weight talk today, which I’m very happy about. Not that I was expecting it, but two appointments ago I was told I was gaining too fast. I said it was a fluke weight as we had stopped for a large breakfast on our way. My next appointment, he noticed that I had lost weight…relative to the fake weight. It has been 9 weeks and I am up 2 lbs on the office scale from the high weight. So nothing was said either way today. Now we shorten up our weeks between appointments! Next is in 3 weeks, and then two week intervals after that. A bit over a week ago, I did a workout that I hadn’t done for a bit (the Moms Into Fitness youtube video mentioned here). It has more squats and lunges than I’ve been doing lately. The next day or three my legs were so sore, so I knew I needed to up my workouts to include more legs. Each week, I say my plan is three strength training workouts. Lately it has been three but the third has been something lighter. Usually this is because I have needed to sleep in one day and I have difficulty working out at night. So evening workouts get a bit less structure and time. And the planned workout becomes something entirely different. Today and whenever I lift next this week, I will add squats and lunges to finish off my workout. I will need the extra leg strength as first my belly continues to grow and then to carry a child with me. I do both with hand weights by my sides, not with a weight on my back. It isn’t recommended to use a barbell on your back during pregnancy. I have no noticeable soreness from this morning so far! I also recommended some workout pants to a woman at the gym but I’m not sure if I mentioned them here. Most of my pants are from Old Navy, but ether ones I have from For Two Fitness are my favorite! Great material and the foldover waist is still not bulky. They weren’t priced quite as nice as Old Navy, but I do think they are worth a little extra. I think they will hold up nicely if you plan on another pregnancy or have a pregnant friend to pass them on to. 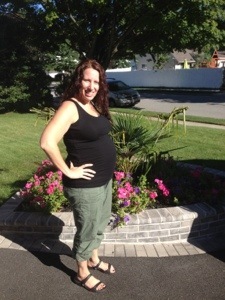 I have done three different prenatal yoga workouts from the prenatal section at yogadownload.com. Before I was pregnant, I did hot (Bikram style) yoga 4-6 times a week. I miss it! I miss the yoga and the people. I look forward to returning to the studio, though I’m sure it wont be as regular or often as before. But this is a review of what I’ve been doing during pregnancy. So, in order of length of time (and coincidentally, difficulty), these are the specific workouts I’ve tried so far. – Prenatal Yoga #1 (20 minutes – FREE) – Love this! It is a short and easy workout that I just actually tried this weekend. I hope to work it in a few times a week from now on. It moves slowly, is good for all levels and has you hold a few poses for a minute to mimic a contraction. And the fact that it is free, means everyone should go get it! So go, and then come back and read the rest of this post. -Prenatal Vinyasa Flow(45 minutes – $5.99 for download) – A little more difficult but doable for most with a yoga history. It is flowing with the beginning feeling faster to me than the rest, which is how I find most vinyasa classes. This is purposeful though, to get you warmed up. But by the end it is relaxing too. -Power Prenatal (70 minutes – $6.99 for download) – Whoa. This one I had a difficult time with, not getting through the whole 70 minutes the first time. But it was a very good workout! I would not recommend this for someone who wasn’t doing yoga often before pregnancy. And the pose guide is very important. I needed to refer to it during the workout, having not looked at it prior. This one also had some more difficult holds to mimic contractions. I definitely appreciated this not being a “prenatal yoga should mostly be breathing” workout. I like being challenged! All of these workouts have different options in the site, with different prices for different lengths. I have several of their other classes also and like that they have many 20 minute workouts available for free…great if you want a quick workout.